Your donations are used to offer scholarships to People of Color, in need of financial assistance, to attend key Shambhala programs. Since 2005, over 50 Scholarships have been awarded. US donors please specify SPOCSF during checkout. Please use Shambhala Giving form to donate. Add a note: “Shambhala People of Colour Scholarship Fund for a Canadian tax receipt” in the Comments field before you submit your donation. Thank you! Your tax-deductible generosity makes these awards possible! Note that incoming donations are processed by the Sakyong Foundation, and 100% support the Shambhala People of Color Scholarship Fund. Are you inspired to make a gift that keeps on giving? Consider making a planned donation as a bequest to SPOCSF! We have a seed endowment that you can nurture. The Board of Directors would like to take this opportunity to thank Ms. Marilyn McGuire for her thoughtful gift. 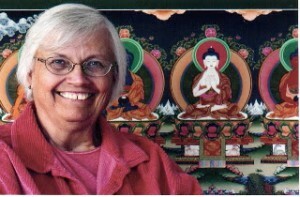 Marilyn was active in the Minneapolis Sangha for many years. Marilyn had a terminal illness and decided to make a planned gift to Shambhala. Her gift to the Shambhala People of Color Scholarship Fund was to enable people of color to become leaders and teachers in their communities.